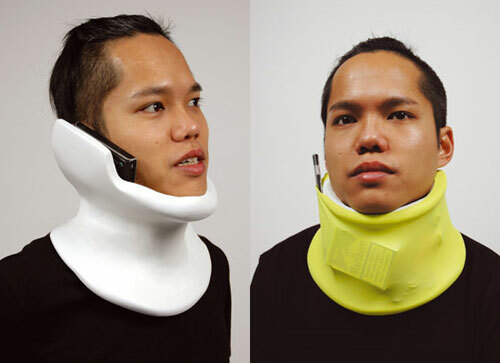 Cell Phone Neck Brace Keeps Your Hands Free To Hide Your Face In Shame | OhGizmo! Don’t you just hate those tiny little Bluetooth headsets that are for all practical purposes invisible and make the people using them appear to be babbling to themselves like weirdos? Yeah, me too. If you don’t want to be mistaken for a crazy person, get yourself one of these hands free cell phone holders that triples up as a random gadget holder and therapeutic neck brace. It’s made of foam, and shaped with a little slot that holds your phone up against your ear just like your hand would if you weren’t so lazy. The stretchable semi-transparent rubber skin holds the rest of your electronics conveniently at neck level, where the arterial blood keeping your face beet red in a perpetual state of embarrassment should keep everything toasty warm. Thankfully, there’s no information on cost or availability.